Boomerang Mario is a transformation based on the Boomerang Bro. Mario becomes Boomerang Mario after obtaining a Boomerang Flower. Boomerang Mario is first introduced in Super Mario 3D Land. In this form, Mario can throw one boomerang at a time to defeat enemies, destroy projectiles, and collect items from a distance. Mario can also jump and move away from it to dodge the boomerang and allow it to move back and forth continuously before collecting it (though its range decreases with each pass-by). If a Boomerang is destroyed in any way after being tossed, Mario must wait a moment before he can toss another (a brief glimmer of light signifies that he can toss another boomerang). Unlike Hammer Mario, Boomerang Mario can only defeat enemies Fire Mario can (as well as Bullet Bills and Banzai Bills). In Super Mario 3D World, the boomerang has a longer range, and both it and the armor are now colored depending on the character using the power-up (red for Mario, green for Luigi, pink for Princess Peach, blue for Toad, and cyan for Rosalina; Mario, however, retains the blue armor). Toad and Rosalina also gain gloves (with Rosalina's being shorter versions of Peach's), and the two girls wear boots in place of the form's normal shoes. Boomerang Mario appears in Puzzle & Dragons: Super Mario Bros. Edition as a Leader, available with the game's digital update to version 2.0, unlocked after earning an SS rank or higher in Course 5 of the Fixed Challenge mode in Score Attack. Boomerang Mario is a Water/Fire attribute teammate with an HP rating of 5/6, an ATK rating of 3/6 and RCV rating of 4/6. Boomerang Mario's Skill, Boomerang Attack, recovers 3,000 HP for the entire party and changes Light Orbs on the Orb field into Heart Orbs. His Leader Skill, Spin Control, raises the ATK of the entire team when the player clears Orbs of 3 attributes or more, for a maximum of 5.5x for 5 attributes plus Heart Orbs (2.5x for three attributes; 3.5x for four; 4.5x for 5. Heart Orbs counts towards smaller multipliers). Boomerang Mario uses Fruit and Rare Fruit to raise his Skill Levels. 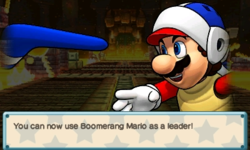 Boomerang Luigi appears as a Leader as well, unlocked after earning an SS rank or higher in Course 5 of the Free Challenge mode in Score Attack. Boomerang Luigi is a Water/Wood attribute teammate with an HP rating of 3/6, an ATK rating of 6/6 and RCV rating of 3/6. Boomerang Luigi's ATK rating of 6/6 makes him the strongest Leader and Water attribute teammate in the game. Boomerang Luigi's Skill, Boomerang Trick, cures the team's paralysis, and is a similar Skill to a Para-Beetle's Support. Boomerang Luigi shares the same Leader Skill and Skill Item requirements as Boomerang Mario. In Mario Golf: World Tour, Miis can use a costume, golf ball, and set of golf clubs based on Boomerang Mario. The ball and clubs are available after playing rounds, and the costume is unlocked when the player succeeds 20 times in Endless Putting Practice. If you know how the Boomerang Bros. like to fight, they really aren't that tough. But if Mario BECOMES a Boomerang Bro–Boomerang Mario–what then? Will his opponents be stunned by his new moves? At the least, throwing a boomerang makes things more fun! Artwork from Super Mario 3D Land. Boomerang Mario stamp from Super Mario 3D World. Boomerang Toad in Super Mario 3D World. Boomerang Peach in Super Mario 3D World. Boomerang Rosalina in Super Mario 3D World. The Boomerang in Super Mario Advance 4: Super Mario Bros. 3 (obtained by scanning the Boomerang e-Card from the e-Reader or by taking it from a defeated Boomerang Bro) highly resembles the boomerangs thrown by Boomerang Mario. Boomerang Mario was created in response to Pom Pom's boomerang projectile during the development of Super Mario 3D Land. In the Super Mario Mash-Up Pack in Minecraft, Boomerang Mario appears as a playable skin. ↑ Daan Koopman (19 October 2011) Super Mario 3D Land. Nintendo World Report. Retrieved 2 November 2011. ↑ Totilo, Stephen (November 22, 2011). "'When we show a power-up to Mr. Miyamoto, we get a bit nervous.'" Kotaku. Retrieved September 10, 2018. This page was last edited on December 9, 2018, at 09:49.